I’ve been trying to finish up some quilts before starting some new ones. So far, I seem to keep starting small new projects, mainly piecework that’s easy to do from my living room at night while the kids are sleeping. What can I say? QuiltCon left me feeling super-inspired and intensely motivated. I have, however, finished off two quilts that make me pretty happy. One is this little guy here. 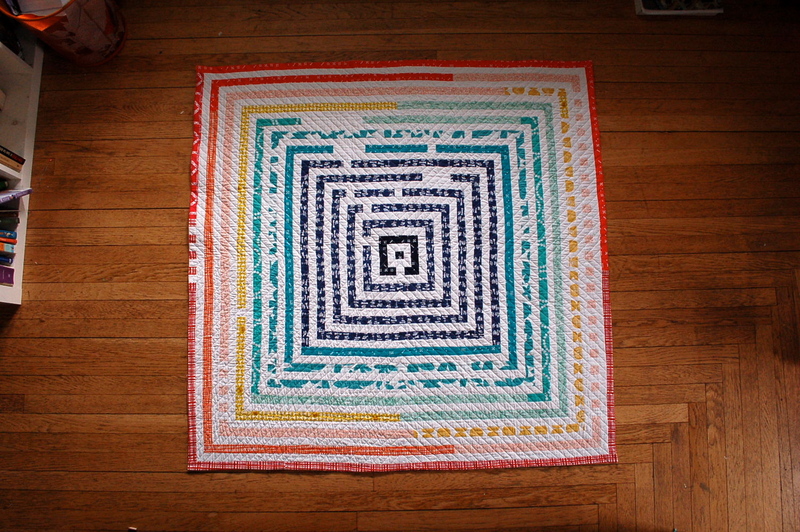 Measuring 50 x 50 inches, it’s big enough to be a lap quilt, but I kinda want to hang it on a wall. It’s a little bit Frank Stella with a Chawne influence and the vague hint at the labyrinth which inspired me. I was sitting there watching the kids run around the labyrinth and thought that a labyrinth quilt would be fun to make. And I’ve been obsessing a bit over the works of Frank Stella lately – how easily his paintings would work as quilts, how I love his use of color, how I’d like to play with the same exploration of form and color, how his linework would translate into stitches. I started with the notion and just let the quilt build itself from the center out. I had a ton of strips left over from my REVOK inspired quilt, making it easy to just jump right into making it. I maybe could have done another round of red, but I’m ok with it as is. I quilted it in a fashion that I thought suited the log cabin (courthouse step) construction. Not surprisingly, the stitch patterning is similar to one of Stella’s line drawings/prints. Once again, I went with an invisible binding. I noticed when I was pressing my facing in toward the back that the steam seemed to cause some distortion at the edges. Has anyone else experienced this? Do I need to not steam with I press? I’m so used to steaming with I press bias tape/facings on garments, I naturally default to it. I’m curious about how other folks do this. On to more finished projects! Hope you’re all having a great start to your week. It looks so gorgeous! Fantastic job. I love the red line border. 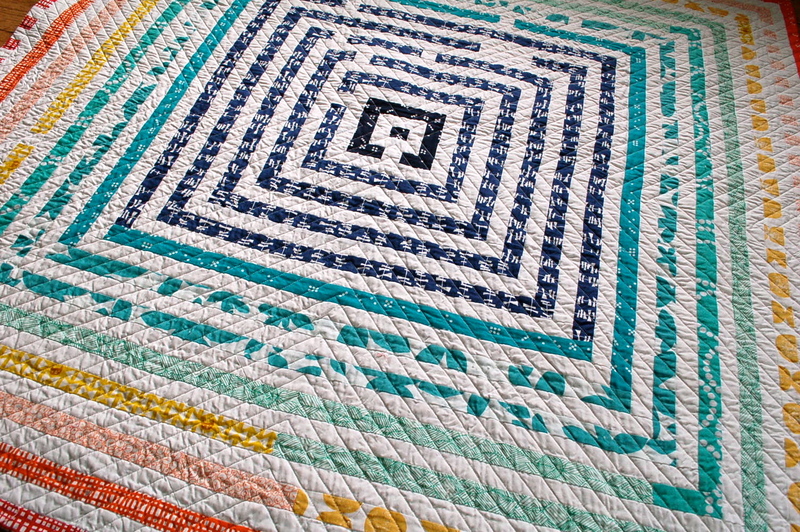 Your quilting pattern is perfect for the design. Perfect choice of quilting! The intersecting lines create an optical illusion, like it’s moving! It’s alive!! !